This is our weekly look at fantasy adjustments you should make based on venue and/or weather. Entering the weekend action for Week 14 of the NFL season, knowing which players should see an improvement or decline in their projection can be a key to victory. I love that the fantasy playoffs come during the time of the year when the differences in weather matchups are most pronounced. Week 14 is definitely no exception. You may be tempted to ride the horses that got you this far. But before you lock in your starting lineups, I recommend you check out my projected venue-and-weather adjustments, which I’ve made for every fantasy-relevant player and are available for Elite subscribers. Here are the ones I find most interesting this week. 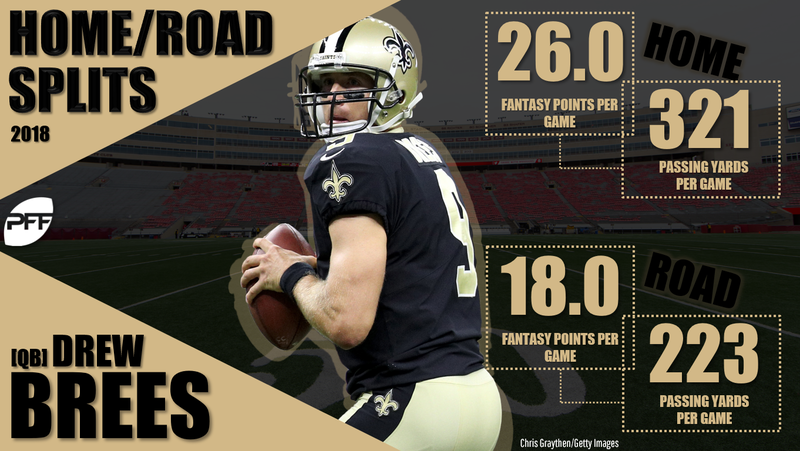 Drew Brees’ (-2.3) extreme home/road splits once again bit fantasy owners last Thursday when he threw for just 127 yards and 1 touchdown in Dallas. He’s failed to throw for 2 or more touchdowns three times this season, and all three have come on the road. His 18.0 fantasy points per game away from New Orleans is worse than the overall averages of 18 regular starters. Brees just isn’t a plus option when he’s on the road, and that makes him an especially tough player to rely on this Sunday when he faces the Buccaneers in a rainstorm in Tampa Bay. Rain hurts passing production and skews more work to the running game, and the Bucs have been as porous defensively against the run as they have against the pass. If the Saints can build any sort of lead, I’d expect them to lean heavily on Alvin Kamara (-0.7) and especially Mark Ingram (-0.3) with those conditions. That could counterbalance the smaller hits that each are projected to take because of the venue and leave Brees and wide receiver Michael Thomas (-1.6) less involved. Thomas owners may have to wait another week before he snaps out of his fantasy funk. I probably should have guessed that Green Bay would become an every-week topic of discussion in this article come November since it gets colder sooner and gets colder period than any other venue in the sport. By this point, you probably know that Aaron Rodgers (+1.8) is impervious to cold weather. It seems unlikely that Matt Ryan (-0.8) can say the same, but it’s difficult to really know because he so rarely has the opportunity to prove it one way or the other. By my accounting, Ryan has played just one regular-season and one playoff game this decade with a game-time temperature below 30 degrees. The first was in Week 14, 2013, and Ryan completed 20 of his 35 passes for 210 yards, 2 touchdowns, and 1 interception, unsurprisingly in Green Bay. The second was in last year’s playoffs in Philadelphia, where Ryan went 22-for-36 for the same 210 yards, 1 touchdown, and 0 picks. For Ryan and the always pass-happy Falcons, those are low attempt and very low yardage totals, and that jibes with my more general research findings that suggest teams throw 2.2% fewer passes and quarterbacks complete 3.1% fewer passes for 0.19 fewer yards per attempt in below-freezing temperatures. It’s a shame, really, because Green Bay is the fourth-friendliest defensive matchup for passing touchdowns. Their 35% bump trails only Oakland, San Francisco, and Miami. Still, I wouldn’t want to rely on Ryan playing in 21 degrees in my fantasy playoff matchups this week if I had a strong alternative with a better venue-and-weather matchup like Deshaun Watson at home against Indianapolis or Tom Brady on the road in Miami. Julio Jones (-1.1) isn’t benchable, but he takes a projected hit, as do Calvin Ridley (-0.6) and Mohamed Sanu (-0.3). Apparently Amari Cooper (+1.0) was all the Cowboys needed to turn their season around. Dak Prescott (+1.7) scored 17.2 fantasy points per game in Weeks 1-8 before Cooper arrived, which was just 23rd at the position. Since, Prescott has scored 19.6 points per game, 12th-best. The Cowboys will practically lock up the NFC East if they can beat the Eagles this week, and that is made easier by virtue of playing at home in the dome. Prescott, Cooper, and Ezekiel Elliott (+0.2) should all see a fantasy boost because of it. 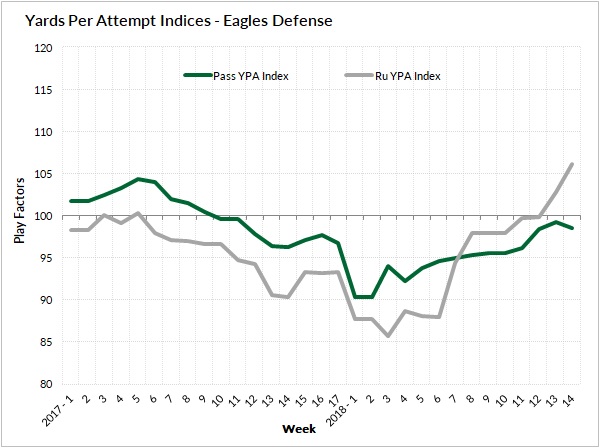 Meanwhile, the Eagles’ defense has proven to be much less formidable than they were leading up to their Super Bowl win. At that time, they were limiting teams to about 10% fewer passing and rushing yards per attempt. But over the course of this season, those totals have slowed regressed back to average. Elliott and Cooper are no-brainer starts, but I expect Prescott to outscore a number of quarterbacks who would typically be ranked above him, his opponent Carson Wentz (0.0) included. Wentz gets the same dome bump that Prescott does, which is a major benefit in a week where about half the teams in football have cold or worse weather conditions to deal with. However, Wentz will likely suffer on the road against a Cowboys defense that has matured into one of the better all-around defenses this season.